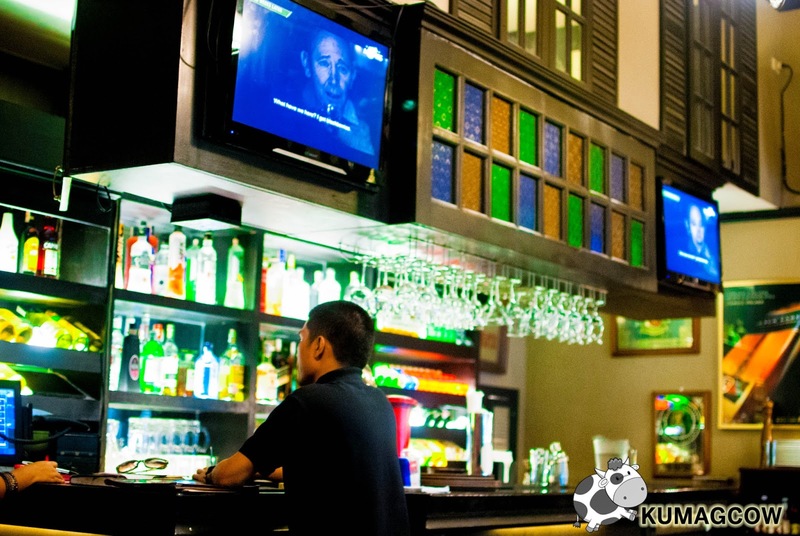 We have seen a dark mottled English pub in the cloisters of Valero corner Sedeño in Makati named Bowler. Named after the hat akin with commerce in the early 1900's, this watering hole was drawn to be a restaurant for businessmen. The overt piece of Londonesque after-hours joint sits open to its patrons 24 hours a day from Monday to Saturday. It also can cater to around 100 people, ideal for small events, parties, product launches and just about anything. The dark wooden cabinetry, the moderately lit wall sconces and striped bunk chairs looked warm and ritzy. It's a place where can relax, cozy up and lost track of time. The spot has some corners with touches of allure in a gentle, manly way conducive socializing and dining. To this, Chef and partner Kim Ochona prepares a menu that coequals the genre of this place and did what is necessary. A simple hearty meal, a place after work and an ice cold bottle of decent beer. This is the Bowler Caesar Salad. Cold, crisp and freshly chopped Romaine lettuce tossed in creamy Caesar dressing topped with crunchy bacon bits, lightly toasted croutons, Parmesan cheese and a poached, still warm free range egg which you can spread all over, make it creamier in the end. Doesn't that look dreamy? This one's the Pumpkin Pesto Soup. When it's cold outside and you want something hearty, this just might just be your best bet. Think of roasted pumpkin chunks triple passed through a mill until it becomes soft and velvety. Don't think that the pesto flavor might spoil the soup because it complements it quite perfectly. The creamy consistency plus the nutty tinctures that swirls on this bowl would make anyone sit by the window and daydream. It's a cross between southwestern cooking and a hint of Italian spun like a fusion of flavors. Be prepared to close your eyes every time you take a bit out of these Yorkshire Beef Bites (aka Beef Salpicao). A worthy adversary to the best seller (which you'll see later), these slices of beef tenderloin takes that intense garlicky profile into a whiff of otherwordly matter they can set their eyes on. Slices of garlic, mushrooms and a handful of spices makes this the splendid pair with light or dark beer available in the pub. Bowler's Fish and Chips is voted best in the metro, and we know why. It's beer battered Cod deep fried, until golden brown to perfection and crunchy on the sides. It is served with Sarson's Malt Vinegar, a mound rough cut crispy of potato wedges, a slice of lemon and tartar sauce. They have served it with the wedges underneath though instead of the side but it was sublime! It could get the backing of a bevvy nearby so get one handy. This might be an odd ball on the menu but it felt so right at that time. This is their Beef and Chicken Persian Kebab. Bowler has a deep understanding of seasoning meat and poultry the right way so these wonderful protein slices taste so good after getting cooked in metal skewers. Be careful as the skewers may still carry the heat from the fire. Bubble and squeek smothered in light butter provides a dandy side dish. We could live here. You need not to be dog's dinner when in Bowler nor have supper in this place for donkeys years. Take a trip to the Ground Floor of Paseo Parkview Suites, Valero Street corner Sedeño, Makati City and you'll find Bowler a sensational gustatory experience. Bring your Enjoy Philippines Android, iOS app and vouchers so you can enjoy 10% off of food and beverage or 60% off best seller Fish and Chips. Come check out other deals on their official website http://enjoythebest.ph/. Call, or reserve by calling 894 3589. You deserve the best of course!